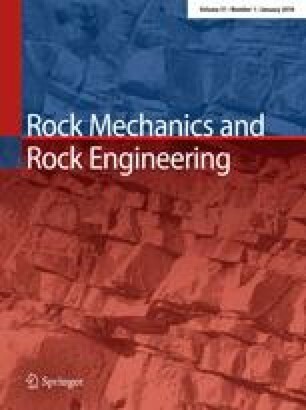 This paper presents a new procedure for determining the fracture toughness of rock-like specimens using the diametric compression test with the center-cracked horseshoe disk (CCHD) method. Using finite element analysis, a dimensionless stress intensity factor was obtained and a formula was rendered for determining mode I fracture toughness. To evaluate the accuracy of the measurement results produced by the CCHD method, fracture toughness experiments were conducted on the same rock-like material using the notched Brazilian disk (NBD) method. The CCHD tests were simulated using a two-dimensional particle flow code for validation of the experimental results, and a great agreement between the pattern of crack initiation and propagation between the experimental and numerical simulations was observed. Lower values of fracture toughness were obtained from CCHD experiments than NBD tests due to purely tensile stress distribution at the tip of the existing notch in CCHD method.